Boxman Studios recently transformed a forty foot shipping container into a mobile kitchen for Electrolux, one of the world’s top appliance brands. Electrolux is well known for its vacuums, but they also create a wide range of high-end kitchen appliances – and a live demonstration is the ideal setting for an audience to see the products in use. 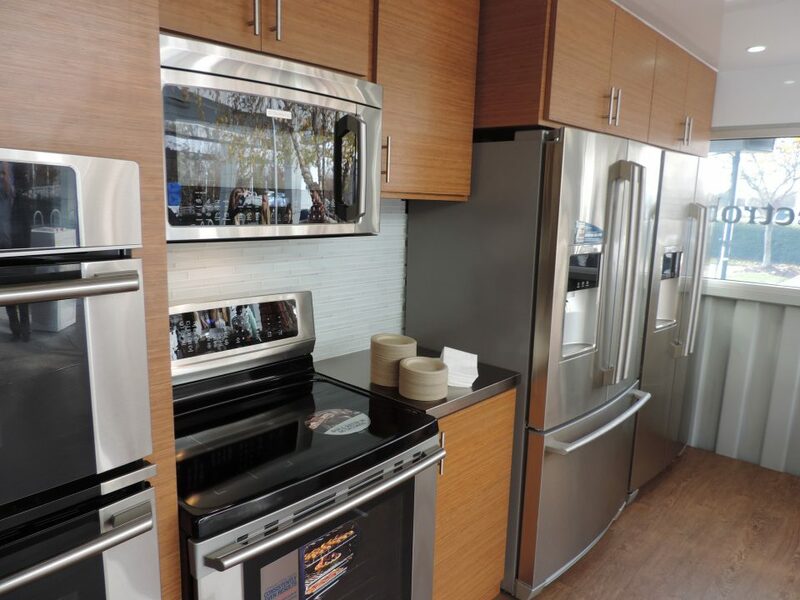 The Electrolux mobile activation is a fully functioning kitchen with all of the comforts of home and then some, including two induction cooktops, double oven, two freestanding ovens, two refrigerators, two microwaves, a washer and a dryer, and an under-counter beverage center. The unit will deploy at large retailers such as Home Depot, Lowe’s, and Menards. Applied a special grout to the glass tile counter which allows it to flex without breaking during transport. Created windows made of bulletproof Lexan plastic. Mounted all appliances with our patent-pending rubber mount. Temporary power mode. This is designed for the demonstration mode. The refrigerator lights and digital control panels, for instance, are on, but the fridge itself does not cool. Likewise, the oven lights and panel are on for demonstration purposes, but the oven does not heat. This is a power-saving measure for times when Electrolux needs to look good, but not cook. Full power mode. With our full power system, we pull a full 200 amps, which is the same power requirements you have in your home. This option allows customers to interact with the appliances just as they would in their own kitchens. Both temporary and full power modes fully comply with electrical codes across North America, and the entire structure is built to engineered stamped drawings to ensure top quality and safety. A 3-year life expectancy before it needs maintenance. We built the Electrolux mobile kitchen activation so Electrolux can take it out on the road and not have to worry about breaking the countertops, backsplashes, and, most importantly, the appliances. A stove that rolls out onto a deck so no interior ventilation system is required. As an added bonus, during cooking demonstrations, the smell of food wafts out over the crowd for a full-sensory experience that allows Electrolux to engage the audience in a much more comprehensive way than a typical marketing experience, floor display, or other static exhibit. As we continue to help brands like Electrolux demonstrate their products and captivate audiences with their message, we take these opportunities to build, test, and create better mobile shipping container environments. We look forward to seeing what comes next.